The Hesston College Larks Softball team celebrated their sophomores Tuesday night. Sophomores Lexi Avalos, Jenna Garcia, Shae Hoover, Cassidy King, Kaylen Lassley, Reese McCrary, Adrianna Ruiz and Jenna Schneider started for the Larks as they defeated Friends University JV 6-1 and 8-1. This took the Larks win streak to 21 games and 29-3 since March 18. Ruiz and Lassley led the Larks with 2 hits each. Freshman Amy Bretado hit her 18th homer of the year and drove in five runs. Bretado leads the nation with 60 RBIs and is second in the country in home runs (National Junior College Athletic Association Division II). Freshman pitcher Chelsea Smith had 17 strikeouts in her seven innings of work in game one. Smith leads the nation in saves with 5, is second with 221 Ks and tied for third with 18 wins. Game two saw much of the same with the sophomores sharing the hits and runs. Avalos, Hoover, Schneider, Garcia and freshman Jessie Miranda each had an RBI each while Bretado had two. The Larks will host Johnson County Community College on Thursday, April 25 in a double header starting at 4 p.m. The outcome of these games will be a major factor in determining the final Jayhawk Conference standings. Johnson County leads the conference with a 13-3 record. Highland is second at 15-5 and the Larks are tied for third with Cowley at 13-5. Hesston College softball has been quietly putting together a pretty nice season. Their continued excellence was on display yesterday as they beat Labette Community College 5-0 and 10-4 in a home doubleheader. The Larks have won 11 straight games and 19 of 22 dating back to March 18. They now sit at 22-11 overall and 9-5 in the Kansas Jayhawk Community College Conference (KJCCC), tied with Labette for fifth out of 11 Division II schools. Game one was all about the 1st inning for the Larks. The bats quickly came alive in the bottom of the inning as Jessie Miranda singled and scored on a Lexi Avalos single. Sadie Leatherman stepped up to the plate, fouled off the first pitch and then sent the second pitch yard for a 2-run homer. Amy Bretado reached base on a Cardinal error and Paige Bittle took full advantage on the next at bat. Bittle hit the second 2-run shot of the inning to give the Larks all five runs they would need to win the game. Current KJCCC ‘pitcher of the week’ pitched another fantastic complete game. She allowed just one hit and had 4 strikeouts. Game two was a little nervier for the Larks. They went down 2-0 in the 2nd before scoring four in the bottom of the inning. Then the Cardinals scored two more in the 3rd inning to tie the game. The Larks pulled away in the bottom of the 3rd, scoring six. Miranda had three hits, drove in one and scored twice. Anyssa Aguilar had two hits, scored twice while driving in one. Avalos also recorded two hits with three RBIs and one run. Bretado and Bittle both hit home runs, giving the Larks four total on the day. The Larks will travel to Coffeyville on Saturday, April 13, then host Sterling College JV on Tuesday, April 16. Over the last five days, the Larks have had an impressive run winning 6 of 6. Thursday they defeated Kansas Jayhawk Community College Conference (KJCCC) opponent Fort Scott Community College 11-5 and 4-3. On Friday they topped KJCCC opponent Pratt Community College 11-6 and 7-0. They finished up the five day journey with a two wins in Lincoln, Neb., as they beat Southeast Community College 3-1 and 10-2. Add these to a March 31 win vs KCKCC and a double header sweep of Tabor College’s junior varsity squad and the Lark win streak stands at 9. The weekend started off with a massive win for the Larks. The Greyhounds of Fort Scott have had the Larks number for many years. Leading the Larks over the two games were Kaylen Lassley with three hits and three RBIs, Jessie Miranda with two hits and two RBIs, Paige Bittle with two hits and four RBIs and Chelsea Smith with 21 strikeouts. Pratt fell at Hesston the next day. The Larks looked sharp offensively with Amy Bretado driving in five on the day off of three hits, two of which were home runs. Lassley had five RBIs on three hits as well. Sadie Leatherman and Adrianna Ruiz each homered on the day. Smith got the complete game win with nine Ks in game two. Game one in Nebraska was pretty quiet with the bats. Two solo home runs by Leatherman and Bretado led the offense while Smith gave up just one hit with 13 strikeouts. Game two saw all of the scoring for the Larks in the 3rd and 7th innings. Lexi Avalos had four hits scoring once and driving in one. Lassley had two hits driving in three and Bretado had another home run and drove in two. It was a team effort on the mound earning six Ks. The Larks will finish the KJCCC season over the next two weeks and have a chance to host a playoff game. Their record stands at 20-11 and 7-5 in the conference. Hesston College softball got a rare break from the Kansas Jayhawk Community College (KJCCC) schedule and hosted Tabor College JV Tuesday, April 2. The Larks recorded two wins, 12-1 and 10-2 over the Bluejays. Game one was highlighted by Chelsea Smith who drove in 6 on the day, including a 1st inning grand slam. Five other runs in the first all but sealed the victory early for the Larks. Smith also led from the mound, going four innings with seven strikeouts. Game two was much of the same for the Larks. Amy Bretado was the star as she hit two home runs and drove in five. Bretado was also the winning pitcher in the game as she went four innings and struck out four. The Larks will get back in to KJCCC play as they host Fort Scott Community College on Thursday April 4. Hesston College softball had an excellent weekend. The Larks won 2 at home – 5-2 and 10-5 – in their first Kansas Jayhawk Community College Conference (KJCCC) games against Cloud County Community College on Friday, March 22. Sunday afternoon they made up an early season cancelation against Kansas State University Club team sweeping the doubleheader 4-0 and 10-2. Game one vs. Cloud County saw Chelsea Smith getting the win from the rubber and Amy Bretado earning the save. Sadie Leatherman went 2-2 with a home run to lead the Larks at the plate. The 10-5 win in game two was highlighted by a big fourth inning. Lexi Avalos, Paige Bittle and Bretado all had multiple hits for the Larks with Bretado driving in three runs in the game. Sunday, it took a while for Hesston to get rolling and a 2-run 4th inning was the needed spark. But game one was highlighted by Smith again from the mound. She threw a complete game giving up just one hit and two walks while striking out 16. The Larks committed no defensive errors and Reece McCrary make 17 plays in the field. Seven different Larks recorded hits. Game two saw the Larks pick up where they left off in game one, scoring multiple runs in the 2nd, 3rd, 4th and 5th innings. Jessie Miranda went 4-4 with 2 RBI. Avalos and Bretado also had two RBI each. Hesston College will resume their KJCCC play with away games at Highland Community College on Tuesday, March 28 (3 p.m.) and on Saturday, March 30 when they host Kansas City Kansas Community College (noon). Hesston College softball opened their Kansas Jayhawk Community College Conference (KJCCC) season March 21, earning two wins against Allen Community College. Chelsea Smith threw a no-hitter with seven strikeouts in game 1 to earn the win, 12-3. Consistency was the theme for the first 4 innings. Each inning the Larks had three runners cross the plate. Kaylen Lassley, Adrianna Ruiz, Lexi Avalos and Paige Bittle each recorded multiple hits. Jessie Miranda had two-RBIs to lead the lineup. Zero errors on the defensive side of the game were highlighted by great defense by Sadie Leatherman who saw seven chances at her position. Game two took a bit more work as the Larks squeaked out the victory in an extra inning, winning 8-7 in the 8th. A big 4th inning saw the Larks take a 6-1 lead. Allen got two back in the 5th and took the lead in the 6th. Amy Bretado homered and Lassley and Miranda each had three hits to lead the Larks in the game. Bretado threw four and two thirds innings, giving up five hits and three runs. Smith returned in relief, earning the win over three and a third innings with four hits and four runs. The Larks move to 7-8 on the season and 2-0 in the KJCCC. They take on Cloud County Community College Friday March 22 in Hesston at 4 p.m. and then host Kansas State University Club team on Sunday at 2 p.m.
Hesston College softball had played only two games in a month as weather kept the Larks off the field. Yesterday they rang in the post-spring break stretch with two wins at home against Bethel College JV, 6-1 and 5-3. Game one saw Chelsea Smith on the mound for the Larks. Chelsea started the game well, striking out four of the first five batters faced and finishing the day with eight Ks. The bottom of the first inning saw just as much production from the offense. The top of the order – Jessie Miranda, Kaylen Lassley, Lexi Avalos and Sadie Leatherman – all reached base to start the inning. Lassley drove in one with her double to right field while Avalos scored Lassley with an infield single. Bethel attempted get back in the game in the top of the third with a solo home run. The Larks would not be out done. In the bottom of the 4th, Adrianna Ruiz hit a solo shot to restart the offense. The next two batters, Jenna Garcia and Miranda both singled bringing Lassley to the plate. Her three run bomb to right field put the Larks up 6-1. Smith pitched the complete game win, striking out eight and giving up one run. In game two it took a little while for the Larks to get started. Bethel took a 1-0 lead in the top of the second. The Larks were patient batters in the bottom half of the inning. After the first out, three consecutive Larks – Anyssa Aguilar, Jenna Schneider and Cassidy King – reached reached base on walks. A fielder’s choice gave Bethel their second out, but Miranda stepped to the plate and patiently walked, earning an RBI and bringing home the tying run, 1-1. Lassley hit an infield single to score a run and give the Larks their first lead of the game, 2-1. Hesston extended their lead to 3-1 in the third on a King RBI that scored Aguilar. The top of the 4th made things interesting for the Larks as Bethel got two back and evened the game at three. The Larks sealed the game in the bottom of the 4th. A Lassley sacrifice advanced Miranda to 2nd and Maleah Sandy to 3rd. Avalos hit a grounder to the outfield, scoring two. Lassley had 5 RBIs on 3 hits on the day and Avalos added 3 RBIs. The Larks hope to be back in action on Thursday as they travel to Allen County Community College to open up their Kansas Jayhawk Community College Conference schedule. Hesston College is a 2-year college associated with the Mennonite Church USA. The Larks compete in the Kansas Jayhawk Community College Conference and Region VI of the National Junior College Athletic Association. 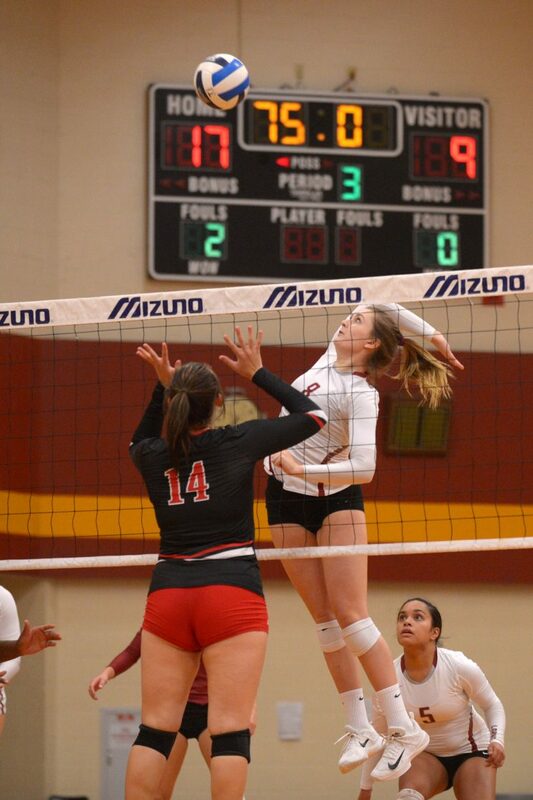 Hesston College competes in fourteen intercollegiate sports. Named to the first team with a GPA of 4.0 were Landon Baer (North Lima, Ohio), men’s soccer; Jenna Boller (Kalona, Iowa), women’s soccer; Jeremy Deckinger (Wichita, Kan.), baseball; Jade Gleason (Brush, Colo.), volleyball; Cal Hartley (Benton, Kan.), men’s basketball; Luke Hertzler (Harrisonburg, Va.) men’s soccer; Kylee Kasselman (Claflin, Kan.), volleyball; Kate Kilmer (Goshen, Ind. ), women’s cross country; Cassidy King (Cochranville, Pa.), volleyball; Kaylen Lassley (Salina, Kan.), softball; Levi Litwiller (Hopedale, Ill.), men’s cross country; Nicole Loewen (Hutchinson, Kan.), women’s tennis; Taylor Longenecker (Harrisonburg, Va.), men’s track and field; Faith Manickam (Hesston, Kan.), women’s soccer; Elizabeth Miller (Archbold, Ohio), women’s cross country; Rio Mori (Osaka, Japan), women’s tennis; Curtis Oesch (Caldwell, Idaho), men’s tennis; Hannah Rosenbaum (Richmond, Texas), women’s tennis; Jaelyn Rufenacht (Pettisville, Ohio), softball; Jenna Schneider (Lodi, Calif.), softball; Morgan Sterner (Lehi, Utah), women’s basketball; Harune Suzuki (Osaka, Japan), women’s tennis; Bryson White (Fort Worth, Texas), men’s soccer; and Sadie Winter (Newton, Kan.), women’s cross country. Named to the All-Academic Second Team with a GPA of 3.80 to 3.99 were Sam Amarante (Lodi, Calif.), softball; Kenzie Brown (Estes Park, Colo.), women’s soccer; Andre Eanes (Harrisonburg, Va.) men’s cross country; Faith Hallmark (El Dorado, Kan.), volleyball; Zac Neely (Ada, Okla.), men’s basketball; Caitlyn Nichols (Mesa, Colo.), women’s basketball; and Payton Yehnert (Parker, Colo.) women’s soccer. Named to the All-Academic Third Team with a GPA of 3.60 to 3.79 were Alexis Avalos (Yucaipa, Calif.), softball; Savannah Bontrager (Milford, Neb. ), women’s cross country; Sierra Broce (Goddard, Kan.), women’s cross country; Annalys Hanna (Fraser, Colo.), volleyball; Jacob Harris (El Paso, Texas), baseball; Shaelyn Headrick (La Junta, Colo.), women’s basketball; Preston Judd (Hayden, Ala.), baseball; Kaede Nakada (Tokyo, Japan), women’s tennis; Miho Okuda (Chiba-ken, Japan), women’s soccer; Haley Unruh (Wilmore, Kan.), volleyball; and Lindsey Yoder (Millersburg, Ohio), women’s soccer. Athletes, coaches and athletic staff gathered this evening to celebrate the 2017-18 school year. Participants recognized academic achievement, team success, individual accomplishment, the growth of the student-athletes at Hesston College and presented the department’s highest awards – Athlete of the Year – to male and female recipients. Chosen by vote of the athletic department staff, the award goes to the students who best exemplify high athletic achievement, positive lifestyle, contribution to the greater campus community, sportsmanship and a strong representative of Hesston College, both on and off campus. The 2017-2018 recipients are Ashley Yasin (softball) and Jeremy Deckinger (baseball). Ashley Yasin has had a tremendous career. She has excelled as a nursing student and from the mound for the Larks softball team. She has amassed 31 career wins, a school record, leading the team to its best two seasons in history. Her career records also include 371.2 innings pitched and 352 strikeouts. Her most impressive statistic is leading the NJCAA in strikeouts during the 2017-18 regular season. Deckinger’s on field accomplishments include being top ten all time at Hesston College in each of the following categories: career RBI (52), single season hits (44), single season doubles (10), and single season RBI (36). He will graduate as an NJCAA Academic All-American, a certified private and commercial pilot and a flight instructor. Also recognized for their on field accomplishments were those who have received National Junior College Athletic Association (NJCAA) Regional awards. Hesston College competes in Region VI of the National Junior College Athletic Association. The Larks have 12 athletic programs. The Larks will join and compete in the Kansas Jayhawk Community College Conference starting with the 2018-19 school year. On a day meant to recognize the impact that the sophomores had on the Lark softball program, it was appropriate that they shined in two wins over Bethel College’s JV team. The Larks took game one 6-3 and game two 9-4. Sophomores Brianna Baca, Jordan Walton, Josie Noll, Sierrah Long, Ashley Yasin, Kendall Richardson, Joceylyn Chavez, Jaelyn Rufenacht and Taylor Martin have amassed the greatest two-year win total in Hesston College softball history; 26 regular season wins in each of their seasons as a Lark. Monday night they continued their dominance. Baca went 6-6 on the night, Noll and Chavez had three RBI each and Yasin hit a home run and added to her career strikeout count, now at 343. The game begins at 2 p.m. on Saturday, April 28, at Fun Valley Sports Complex in Hutchinson. Coming from southern California (Highland), Sierrah Long thought twice about attending college in the middle of Kansas. Turns out Hesston College had a lot more to offer her than she originally thought. As a nursing major, most schools, such as California State University-San Marcos and California State University-Monterey Bay, didn’t give her the option to do sports in addition to her rigorous career path. Luckily, head softball coach Andrew Sharp ’99 offered her the chance to do both. And soon after that, head volleyball coach Deedee (Martin) ’02 Landes wanted Long on her team as well. Landes saw her potential even after Long had been passed over by Hesston’s previous coach. After consulting her parents and Sharp, Long said yes and joined the volleyball team at the beginning of her freshman year. As an outsider hitter for the Larks, Sierrah Long looks to record another kill. This year, she figured out a way to do only volleyball in the fall and only softball in the spring, making her schedule a little more bearable, she said. Juggling two sports wasn’t completely foreign to Long. After two years of playing for two teams, Long has found value in her Hesston experience. Her greatest achievement comes from being a dependable teammate to other players. Her teams give plenty back to Long and help her outside of athletics. As a faith-oriented group, her volleyball team helped with classes such as Biblical literature, a subject Long had never encountered before. And with many nursing majors on the softball team, she has a go-to group to help in that subject area. While her teammates greatly influenced her time at Hesston, her coaches also became a big part of her college experience. Both of her coaches are impressed by the person and athlete Long has become. Landes also sees her consistency and leadership qualities on the court. by Sarah Miller ’18, first published in the Hesston Horizon. Lark softball defeated Independence Community College 8-2 and 3-2 yesterday in Region VI competition in Hesston. Hesston College moved to 21-16 on the season. The Larks are inching closer to the wins in a season record. They need to win half of their remaining 12 games to improve on last year’s record setting season. Game one got off to the perfect start with three-up and three-down for the Larks defense. In the bottom of the first, the Hesston College offense was smart and efficient, taking advantage of an error, hit by a pitch and two walks. Making sure the ball got into play coupled with quality base running allowed the Larks to close the first with a 3-0 advantage that Independence would never overcome. The Larks added three more runs in the fourth and two in the fifth to win 8-2. Game two took a lot more quality and a walk-off two-RBI hit from Lexi Avalos in the seventh to earn victory. The Larks got on the board first with an unusual play, a double steal. Kaylen Lassley attempted to steal second while Taylor Martin was on third. As the catcher threw out Lassley at second, Martin stole home. This gave Hesston College the 1-0 advantage until Independence got one back in the third and went ahead with another run in the fifth. With one out in the bottom of the seventh, the Larks were down 2-1. Martin was on second and Brianna Baca was on third as Avalos stepped up to the plate. Singling a hard ground ball into right field was all Hesston College needed to complete the come-from-behind win and take both games on the day. Avalos went 4-6 on the day including that two RBI walk-off. Martin also had a nice day with two RBIs and four runs scored. Ashley Yasin added two wins and 13 strikeouts to her season and career record totals at Hesston College. The Larks will be back in NJCAA Region VI action on Friday at Neosho County Community College and on Saturday at Allen Community College. Hesston College prides itself in making sure students are not just a number. But what about 117, or 8.97 or 25? What do those number mean to the Hesston College softball team? They stand for strikeouts this season, strikeouts per game and total Lark wins. All numbers that Ashley Yasin has made her own on the softball diamond for the Larks this season. Yasin broke the all-time wins record at Hesston College (24) by defeating the #9 Cowley Tigers last week. She leads all NJCAA DII pitchers for the most strikeouts in the country with 117 on the year. Yasin also holds the career strikeouts record at Hesston College with 253 Ks and counting in just a year and a half on the mound. All of these things make Yasin stand out on the field, but what is more impressive is how she stands out around campus, as a teammate and in the classroom. In the classroom, Yasin is also making an impact. As a nursing student – one of Hesston’s most challenging majors – she must stay on top of her game at every level. Not every story ends with breaking records and teammates and staff proud of who you are becoming. But, that is the goal.